If there is one word we can describe how we’re scouting for the needed furniture in the new house, it would ‘minimalist’. Like I mentioned here, the house is not that big so everything that we choose should be retractable or small. This includes the beds because of the size of the bedrooms. Maybe a platform beds like this one will be a good idea for our bedroom. 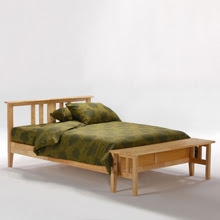 It’s Thyme Bed with the folding Bench Footboard. I like the footboard because I sometimes like to rest my feet on something and I like the fact that I can fold it anytime I want if I need some space. Since I like it so much, I may just get it for our little one’s bedroom as well.